Strong Metal Army Style Bunk Bed. Fits Twin Size Mattress, Sold Separately. 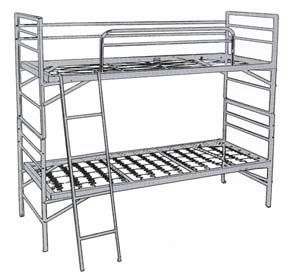 A Wide Variety Of Army Style Bunk Beds Are Available: Army Style Bunk Bed Only, Convertible Army Bunk Bed (Can Convert Into Two Twin Beds), Heavy Duty Convertible Army Style Bunk Bed (Converts Into Two Twin Beds).Please Note: Full Length Back Rail Is No Longer Available For The Bunk Bed. Shorter Guard Rail Can Used For Back And Additional Rails Are Sold Separately. Easy To Assemble. Strong Construction. Twin Size: 40 In. Wide x 62 In. High x 18 In. To the first bed x 50 In. the top bed x 40 In. bed to bed height. Weight Capacity Per Bunk Is 350 lbs. Also available in custom sizes. Please call for the price.